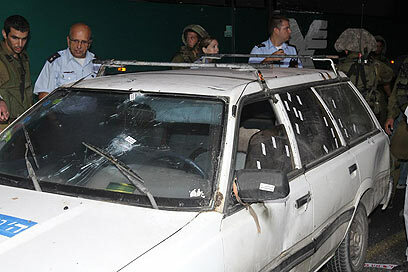 The terrorists who killed four Israelis in a shooting attack near Bani Naim Junction in the West Bank in late August planned to abduct the bodies, Egypt's al-Ahram weekly reported Monday. According to the state-run newspaper, the terrorists planned to bury the bodies and claim the four had been kidnapped in order to hinder the Israeli-Palestinian peace talks. The weekly, which based its reports on Palestinian sources, said that the perpetrators – all members in Hamas' Izz al-Din al-Qassam Brigades arrested by Palestinian security forces shortly after the attack – said in their interrogation that their mission was not "just" to kill settlers, but to prompt Israel to impose a comprehensive closure on the West Bank, thus causing the Palestinian Authority to pull out of the peace talks and bring about the possible resignation of Palestinian President Mahmoud Abbas. According to the weekly's sources, the cell was also ordered to take photos of the scene and grab the victims IDs, as proof of the "abduction," which was to be used as leverage in negotiations regarding the release of Palestinian prisoners. Al-Ahram further alleged that Hamas intended to prompt the IDF not only to clamp down on the West Bank, but also to seize control of several Palestinian villages while trying to recover the four. According to the report, such action by Israel was sure – in Hamas' opinion – to cause Abbas to resign and maybe even call for the complete dismantlement of the Palestinian Authority. The weekly's sources claimed that the attack was carried out on orders of Hamas leadership in Damascus and Gaza. Al-Ahram went on to say that the terror cell responsible for the Bani Naim shooting comprised of three individuals, who chose their location after lengthy reconnaissance. Their plan to abduct the bodies was reportedly foiled by a passing vehicle, which forced the cell to flee the area. Had the plan been executed completely, concluded al-Ahram, the attack would have gone a long way towards realizing Hamas' goals of toppling the PA, taking over the West Bank and stopping the peace process in its tracks. See all talkbacks "'Hamas planned to nab shooting victims' bodies' "